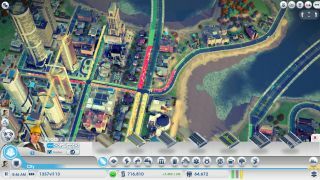 SimCity Lead Designer Stone Librande has posted an official blog entry explaining the causes of some of SimCity's most discussed design decisions and flaws, including the "unavoidable (and illogical) traffic jams" that can form in high-density cities. According to Stone, a pathfinding patch is currently being tested internally, and he hopes to release it soon—you can see some of the in-progress work in the video above. "We understand that when cars always take the shortest route between point A and point B there will be unavoidable (and illogical) traffic jams, so we are retuning these values it to make the traffic flow more realistically," writes Librande. "To dig a little deeper our roads will have a weighting system based on 25%, 50% and 75% capacity. As a road hits those marks it will become less and less appealing for other cars, increasing the likelihood of them taking an alternate path if one exists." Other pathing fixes are coming too, which Librande says will stop emergency vehicles from being blocked into their garages, prevent vehicle clumping, and improve the way public transportation works. As traffic is the primary cause of failure in my high-population cities, the patch can't come soon enough. Librande also states that the "non-essential" features disabled during last week's launch'splosion will be slowly re-enabled. Regional Achievements are now live on "a select number of servers" and leaderboards are enabled on the Test server. "The Sims in the game are persistent in many respects. They go from a home to a workplace or to a shop and back each day. Their happiness, money, sickness, education level, etc. are also persistent and are carried around the city with each Sim as the simulation unfolds. But many aspects of the Sims are not persistent. They don't own a particular house or have permanent employment. We also don't track their names, their clothing, gender, or skin color. We did this as in attempt to increase performance so that we could have more Sims in the city. Ultimately we didn't feel that the cost of adding in that extra layer of micro detail made the macro game play richer. Game design is filled with tradeoffs and compromises like this and we are constantly evaluating these (and many other) decisions." Those are the bullet points, but the full blog post contains some other insight into SimCity's design and the decisions behind it. And just a few moments before Librande's update, I posted an investigation which tests some of the major criticisms players are documenting.